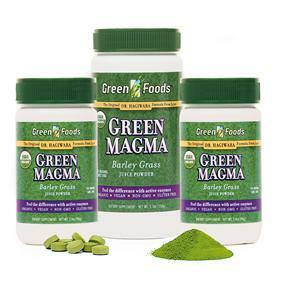 Green Magma is a certified organic extract of young Green Barley Juice - available either as a powder or in tablet form. Green Barley contains over 70 nutrients, including vitamins, minerals, amino acids and enzymes - in particular digestive enzymes and Super Oxide Dismutase (S.O.D.) - a powerful antioxidant. Regular supplementation with Green Magma has many benefits - and can improve digestion, increase energy and aid detoxification. Many of the actives in green barley grass are destroyed by heat or acidity which is why Green Magma is manufactured under very strict controls and using patented processing methods.